USGS scientists deploy SPMD and POCIS samplers to collect waterborne contaminants in Manoa Stream on Oahu, Hawaii. Get continuous real-time water-quality measurements from Water-Quality Watch maps. Get current and historical USGS and EPA water-quality data at the WQP. Get stream ecosystem aquatic bioassessment data from BioData. View a complete list of USGS water-quality data resources. The USGS Branch of Quality Systems monitors, assures, and improves the quality of USGS analytical water-quality data through proficiency testing and by documenting variability and bias of analytical results of USGS laboratories. The USGS Mercury Research Laboratory (MRL) provides assistance and support for USGS regional and national projects in the collection and analysis of low-level mercury samples using ultra trace level clean collection and analytical methods. 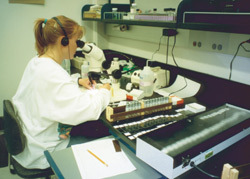 The USGS National Water Quality Laboratory (NWQL) conducts laboratory analyses for USGS water-resources investigations. NWQL determines organic and inorganic constituents in samples of groundwater and surface water, river and lake sediment, aquatic plant and animal material, and in precipitation samples. The USGS Ohio Water Microbiology Laboratory (OWML) works with government agencies, academic institutions, and other partners to study the quality of national, state, and local water resources. The OWML is involved in investigations of processes that affect microorganisms in the environment and testing of new methods to improve detection and interpretation of microbiological presence in water. The USGS Organic Geochemistry Research Laboratory (OGRL) focuses on the fate, transport, and degradation of organic contaminants in the environment and on the effect of emerging contaminants on water. OGRL combines these issues with analytical methods to determine and link to geochemical and hydrologic processes. The USGS Reston Chlorofluorocarbon Laboratory provides the USGS with analytical services for chlorofluorocarbons (CFCs), sulfur hexafluoride, and dissolved gases and administers the USGS contract for tritium/helium-3 dating. The data generated are used in hydrologic studies to trace the flow of young water and to determine the time elapsed since recharge. The USGS Reston Stable Isotope Laboratory conducts research on the use of isotope ratio measurements in studies of water resources and environmental quality. The Laboratory contributes to the improvement of measurement science and the development of isotope databases and provides isotope analyses on a routine basis to a large user community within the USGS and elsewhere. The USGS New York Water Science Center's Soil and Low Ionic Strength Water Quality Laboratory provides accurate measurements of soil water, non-agricultural soils, stream water, and lake water, that can be adapted to the specific needs of each USGS study. Services include sample processing and customized data reports. The USGS maintains sediment laboratories at the Water Science Centers and offices listed below. The services provided vary according to the needs and expertise of the specific laboratory and are available for internal USGS use or by contract through the respective Science Center to other government agencies by virtue of cooperative agreements for work being performed with the USGS.